That which is said to be prevalent amongst the masses, the belief that most people are able to make sound judgments based on basic knowledge and experience, is false. If it were not, there would be no need for Socialtrainers. Whether we have digressed culturally as people is no longer debatable – the masses are simply inexperienced, whining, socially-inept beings who lack the most basic of things, including common sense. Common sense is the ability to understand things that are “obvious”, yet so many people go through life oblivious to anything other than gossip magazines and “Keeping up with the Kardashians.” They lack the basics required to make simple conclusions about a given situation. 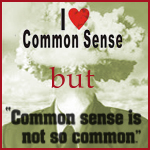 Thus, what was once known to be common should now be called “good sense” and let’s be honest – 99% of you don’t have it! I was raised by a mother who taught me to behave like a southern lady, have modern day ambitions, and to observe others actions, rather than listen to their words to determine what type of person they were. My father ensured I knew how to change a flat tire, shoot a shotgun, and take down any SOB who thought he could take advantage of me. The combination of the parenting, plus my own ambitions in life, have ensured that I know not only how to pick my fights (no petty nonsense), but that I also knew how to fight fairly without unnecessary roughness and understanding that when the whistle is blown, the play is over – win, lose, or draw. 40 years ago, when men disagreed they fought out their differences with their fists. They didn’t fight to the death; they fought for a square win – a mutually respected agreement that one had beaten the other. After that, those men accepted their fates and went about their business until one re-challenged the other at a later date. People understood that not everyone is a winner all the time. It was Common Sense. Today people walk around with a sense of entitlement. They have this “my mom told me I could be anything I wanted when I grew up and now that I went to college and got a business degree, I want to work my dream job as CEO of XYZ Corporation and if this world doesn’t give me that job, then it’s unfair because my mom said I deserve it” mentality. GOOD Sense tells us that your mom MEANT, as long as you work hard, earn your degree, get a job, climb the ladder, and earn your promotions, you MAY one day reach that dream job of yours in this great country that allows you to choose your education and your career path. Like I said, 99% of you do not get it because you don’t have good sense. Don’t worry though; what you do have is very common! 25 years ago, women had worked hard to obtain and manage executive titles while still raising their children. They managed their businesses and households with diligence and respect. They taught their children right from wrong, the gave them household chores to show that nothing comes free in this world, and they expected homework to be completed before TV and Nintendo were allowed to be played. Females respected one another because they knew how hard they each worked to not only get their kids to school on time before they went to a full day of work, but also the superpower it took to get dinner on the table and the entire family seated to eat after a long day. Conversations were about the difficulties of parenting with the introduction of Super Mario to the world and questioning how to keep their children outdoors to play, rather than in front of the TV. Now, women hand their children iPhones with pre-loaded games to keep them busy, while they gossip about last nights reality show and blame teachers for their kids inability to pay attention in school. 99% of you don’t understand what your problem is and again, it’s a common problem. When I was a teenager people had ambition and wanted to be anything but common. My friends have all gone on to get their Master’s or PhD’s and have amazing careers. They are mothers and fathers, raising wonderful children while working as our parents did. They don’t ask for handouts or complain about what this world isn’t giving them because they are too busy. They aren’t marching on Wall Street or filing for unemployment; they are working and paying off their own student loans. Similar to my journey where I started working as a dancer in a theme park (no glory there) and have now, in my early 30’s, worked my way to an executive title in a NYC based corporation, they took work where they could find it and worked their way to better titles and pay grades (Key Word: worked). They WORK rather picket. They set examples for their children that are of strength, dedication, determination, hard work, and reality. They are examples of “The American Dream” which so many have forgotten is the “opportunity for prosperity and success…achieved through hard work”. They aren’t asking for handouts because they have GOOD SENSE. Do you have GOOD sense or a case of the commons?